The pictures and captions below were sent to me by Gene, W9NMX, with the Icom 7300 driving the Ameritron 1500 amplifier. I have always been interested in the reports completed on the Icom 7300 SDR/HF 6m Transceiver. When the radio first came out there was alot of speculation. According to many, it was the first of its kind. So with an Icom 7300 reserved, I knew I was getting one, but would it have a good receiver? How about transmit audio and filtering, who knew? It was anyones guess and everyone who reserved a 7300 had high hopes. Shortly after receiving mine I did my own on-air tests (QSO’s) and waited patiently for the results of others who are much more knowledgable than I am about radios. One of the first reports completed was the receiver tests run by Rob Sherwood. You can see his website and results here. The full test is available for download here. I’ll go out on a limb and say everyone who received an early Icom 7300 was very pleased with his findings. 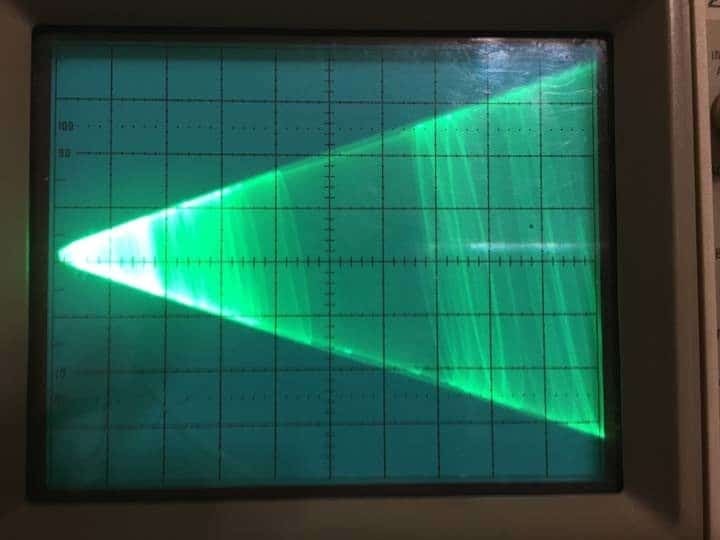 Another fascinating test was performed by Adam Farson,VA7OJ/AB4OJ, and his evaluation and test report is available for download here. It’s definately worth browsing and I was very pleased with his results too. 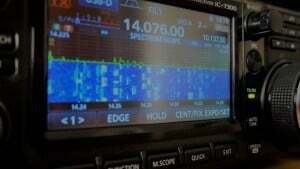 Icom 7300 driving AL1500 to 1500 watts. Trapezoid from speech. Note the very straight sides and no flat topping at peaks. Back in April of 2016 and after having it for only a few weeks I was impressed. It’s so easy to use and audio reports with the hand mic were great right out of the box! After having it almost a year now I am still impressed and the reports here and what I continually receive from others confirm my personal view. The 7300 has proven to me to be a reliable transceiver and has a very good receiver. Transmit audio is excellent in my opinion. Operating on digital modes is better than ever for me. The 7300 was only $1499 at the outset and can be had for much less today. Thank you Gene, W9NMX, for performing the tests on the Icom 7300 driving the Ameritron 1500 and for sending me the photos! I look forward to more. You always have a wonderful signal from Florida. Here’s a short audio clip of Gene with his Icom 7300 and Ameritron 1500. I usually operate SSB, however this radio holds its own on AM too! My experience and opinion of Icom is that they have had some exceptional recievers but I never considered them exceptional “talkers” like for instance the Kenwood 830 or many of the loud Yaesu’s you hear out there. This 7300 not only hears exceptionally but it is also an exceptional high fidelity talker too! Thanks for commenting Brian and thank you for putting in your audio settings for the Icom 7300. I totaly agree on your assessment, the 7300 hears exceptionally well and the stock mic produces beautiful audio. Best 73, thanks for joining us and I hope to hear you on the air sometime.